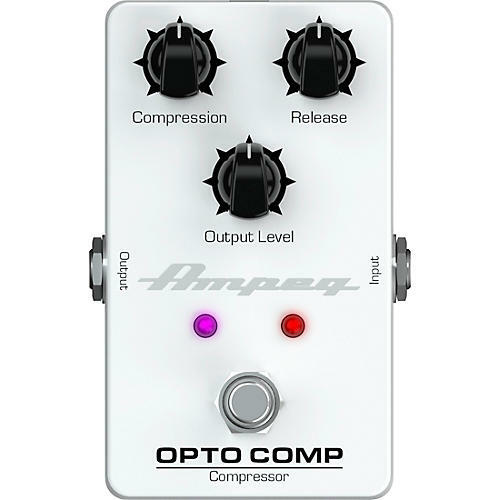 The Ampeg Opto Comp Optical Compressor pedal utilizes an optical circuit to deliver smooth, vintage-style compression to add headroom and sustain to your guitar or bass. Dial in a fast, subtle style to control peaks or crank up the compression to add a unique character to your sound. Perfect your tone with the Opto Comp Optical Compressor pedal. On May 1st, 2009, the Mackie, TAPCO, Crate, Blackheart and Ampeg websites will be updated with the addition of warranty URLs (e.g. www.mackie.com/warranty) expressing new A Stock warranty terms. These warranty URLs will go live on May 1st, 2009. Formerly, warranty periods for these LOUD brands appeared in a variety of locations â in product manuals (for Mackie and TAPCO) and on warranty cards and hang tags (for Crate, Blackheart and Ampeg). In order to streamline and clarify this process, Mackie, TAPCO, Crate, Blackheart and Ampeg warranty periods and terms will be communicated in full on the warranty pages. Any LOUD products purchased prior to May 1st will bear with them the manufacturerâs warranty as predates the new policy. Moving through this transition, in order for customers to obtain warranty service, both the sales receipt and a physical copy of the (older) warranty statement will be required by our Service and Support departments in order to issue Service Requests, etc. If the product was purchased on or after May 1st, 2009, but a physical copy of the older warranty terms is not presented, the new warranty terms and periods will apply. Meanwhile, the products that bear with them the new warranty periods (as reflected in the box contents of each product) are being tracked by serial #, and contain new warranty content referring customers to the appropriate brand website. The information below reflects the product warranty periods that will be effective on May 1st, 2009 for the Mackie, TAPCO, Crate, Blackheart and Ampeg brands: Mackie: A 3-year, nontransferable, inclusive warranty on electronics and a 2-year, nontransferable, inclusive warranty on drivers (where applicable) apply to loudspeakers (active and passive), power amps, powered mixers, and HR studio monitors. Specific models under this warranty include all SRM, HD, SA, C and S Series Speakers, all FRS Amplifiers, all HRmk2 Studio Monitors. A 1-year, all inclusive, nontransferable warranty applies to all mixers, MR Studio Monitors, Control Surfaces, Processors (digital), MR Studio Monitors, Control Surfaces, Audio/MIDI Interfaces, other SR & Recording Products. Specific product models under this warranty include all Onyx Compact, 4-bus and 8-bus, all VLZ3, all PPM, all ProFX, all CFXmk2 Mixers, all MR Studio Monitors, Big Knob, Onyx 800R, all MCU Pro family. Tapco: A 1-year, all inclusive, nontransferable warranty applies to all products and all models. Crate: A 1-year, nontransferable warranty applies to electronics and speakers on all models of MI amps, cabinets, and combos. 90-day warranty on all tubes Blackheart: A 1-year, nontransferable warranty applies to electronics and speakers on all models of MI amps, cabinets, and combos. 90-day warranty on tubes. Ampeg: A 5-year, nontransferable warranty on electronics and a 2-year, nontransferable warranty on speakers apply to all SVT Classic and Pro Series, MI amps and cabinets. A 2-year, nontransferable warranty on electronics and a 2-year, nontransferable warranty on speakers apply to all B Series, all Diamond Blue, and all BA combo amps. 90-day warranty on tubes.